This last week I was talking to a new mom who is a friend of mine. During our conversation, another friend walked up and joined in. We were discussing mommy-hood…..the ups and the downs. The woman, who is also a mom, began telling the new mom that one day she might miss the days when her son couldn’t talk. She proceeded to talk about how her little guy never stops talking…….telling stories, sharing every thought that jumps into his head, and just chattering away nonstop. I think most moms on the planet can relate to this! And on those days……what do you do? You beg either verbally or in your head for them to just be quiet for a few moments. To save your sanity. I have definitely begun having these moments with Townsend. But never Cannon. So, here is my problem. I hear this and it makes me a little sad. Because even though Cannon can talk, he talks in “script,” without functional language. Which is without original thought. I long with every fiber of my being to look into those beautiful, brown eyes of his…… for him to look back without looking immediately away…… and to have a conversation about ANYTHING with my precious son. I want to know what he is thinking, what he needs, and if he is hurting. I want to know if he is happy, what I can do to make his life easier, and what he truly loves. I want to hear excitement in his voice, get a taste what goes on in his imagination, and to have a heart to heart. I may or may not ever hear anything like this. And sometimes…..I let that get to me……and it just hurts. During this particular conversation, I teared up a bit, looked down, and tried desperately to hold my tongue. But for better or for worse, I didn’t. I couldn’t. As she finished telling several stories about the silly things her son comes up with, I made a comment. I said, “And then there are those of us who would do just about anything to have that problem.” As soon as I said it, I regretted it. My intentions were good. My presentation, I felt, wasn’t rude or insulting but quiet and thoughtful. However, I still regretted it because I didn’t want her to think for one moment that I was angry at her, judging her feelings, or that I was offended in any way. This is my issue. My insecurity. I am always trying, in my current state of life, to find the good amongst the tough. I stretch and stretch to try and find even the tiniest thing to be grateful for in a bad situation. And in my mind, I was just giving her something to be grateful for. Even on those days when she wants to pull her hair out. I think in the future we will both probably think twice before we speak. Not because either of us said ANYTHING wrong but just because we had the experience. And maybe just hearing about this conversation will encourage anyone reading this to be grateful for everything about our children. Even the frustrating things! Because the lessons we learn from those blessings are what can bring us closer to God. So, in the spirit of counting our blessings…….here goes my attempt as it relates to Cannon’s issues………. 1) Cannon is a high functioning Autistic child. There are soooo many other parents that deal with countless other issues we do not face. 2) Cannon talks. He may not currently speak with much functionality and zero original thought. But he talks. So many parents of low functioning children will never hear what their child’s voice sounds like. 3) Cannon’s diet may be extremely limited but for the most part……he eats what I put in front of him. Many children with Autism are incredibly picky and will only eat certain textures. 4) Cannon is a lover. He doesn’t shy away from touch like many children with Autism. Sometimes. And the touch he gives is usually brief but he allows it. 5) Cannon has good days. Not usually back to back…….but he has good days. They aren’t all bad. 6) Cannon does not lie. 7) Cannon does not cheat. 8) Cannon does not steal. 10) Cannon’s fine motor and physical abilities have greatly improved with considerable therapy. 11) We have met some amazing doctors, therapists, nurses, special needs teachers and aides. Wonderful people with enormous hearts that have helped us so much and enriched our lives just by being a part of ours. 12) We have met some phenomenal and strong parents going through similar things that we can draw strength, knowledge, and encouragement from. 13) Prayer Warriors have come out of nowhere to lift up our son! What a beautiful gift! We feel them friends! I can promise you that! Finally, I want to share with you why I chose the song that plays when you log onto this site. It is not just because I liked it. It’s because of the message of the lyrics and how they reflect my feelings on our struggles. The song begins by talking about all the things we generally pray for. Then, about how God hears every prayer and knows what is best for us. And how the answers to our prayers may come in different ways than what we ask for or expect. I really relate to one particular line. It says “What if a thousand sleepless nights are what it takes to know YOUR near…….What if trials of this life are your mercies in disguise.” I do not know WHY God chose to have our family go through these trials but I DO know that I am closer to HIM now than I have been in a very long time……maybe ever. And that I trust HIM implicitly to take care of my family. 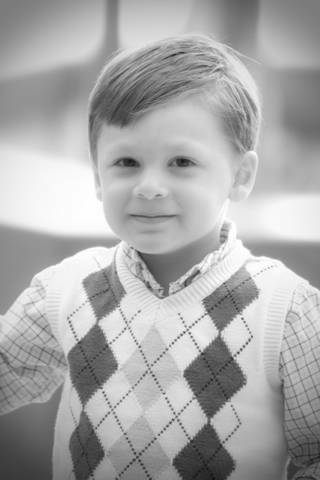 When Cannon was first diagnosed, I ignored God. I didn’t have time for him. That is what I told myself. I was too busy doing all the things that this new issue required of me to do. I went to church on Sunday and ultimately believed what I was hearing but there was no application into my life, no quiet time with Him, and no real relationship. It was sad. I was miserable. And I couldn’t shut my brain down at night. There were a million thoughts, questions, worries, concerns, and things to do. I couldn’t sleep when I could sleep. I wanted to and I needed to change. But I also needed to hit rock bottom before I was desperate enough to do something about it. During one of Cannon’s hospitalizations…. I finally did. So, I began to pursue change. I focused. I began reading my Bible again, worshipping God through music while meditating on the words. Praying over my child each night. And reading devotionals and other Christian books. And later, I began this blog. I had been feeling for a long time like God wanted me to do this but I resisted. I wanted to keep our business our business. When I finally obeyed, the blessings rained down on me. The accountability, focus, and strength I draw from writing to ya’ll is invaluable! I treasure it! Thank you for blessing me and my family with your love, support, and concern! The later part of the song talks about how we pray begging to hear God’s voice and get mad when we can’t. So, then come the doubts…..about God’s goodness and love. Embarassingly enough, I had some of those, too. I called it my “crisis of faith.” Until I got myself back on track. The song tells of how we ignore God’s promises. And all during this time, He is still listening, still providing our needs as He sees fit, but loves us too much to give us less than what His plan is for our lives. And then comes the kicker, the fact that our pain reminds us that this is not our eternal home. Our suffering WILL end and one day we will get to feel the arms of Jesus around us. What a beautiful, inspiring song! When, I first heard it, I was creating the blog and had to have it! It was too perfect! It said what I wanted to say but didn’t have the creative talent to do so. I love it! And I hope that now each time you hear it…….it will have new meaning and inspiration to you! I am attaching a video here of Laura Story, the writer and performer of this song, telling her personal back story…….how this song came about. I encourage you to have a listen. It is POWERFUL and she is amazing! Now, go count your blessings friends! I think you will find that there are many, many, many more than you think! And try to look for the positive no matter what you are going through! Our children are always going to be challenging. Encourage them to better things by loving them in spite of their faults and embracing their uniqueness. It will help sustain you! I promise! Much love! Wow! This last week has been something else! Tough. Rough. Shocking. And an incredible challenge for my ENTIRE family! I am sure many of you have heard bits and pieces thanks to social media and word of mouth but let’s get the full story out there, shall we?! I will apologize up front for the length. I truly did try to edit myself…..I just wasn’t successful! Cannon has been struggling with his tummy for quite a while now. In fact, Mark and I looked over my notebook filled with notes on what goes in his body, what comes out, and his behavior. We found that he was good for exactly one week after his last hospitalization for impaction……and then went downhill again. So, he has been literally feeling like garbage since 4/29. And the severity of his symptoms have been building and building. We went to see his G.I. doctor 3 weeks ago to discuss what to do now that surgery is not an option and to talk over potential reasons why he is in so much pain. His doctor wanted us to start him on prebiotics. Cannon already takes probiotics which help to populate the intestinal tract with “good” bacteria. And prebiotics aid in growing “good” bacteria. So, I purchased some Agave Inulin (a prebiotic) and began adding that into his regular supplementation routine. Well, unfortunately nothing has changed at all. Cannon has been asking you to rub his poor tummy constantly, crashing it into things for relief, having lots of bad behavior (which is not characteristic), screaming A LOT, having extreme anxiety, stimming, and scripting much more, sleeping 1-1 ½ hours less a night and waking for 2-3 hours during the night with lots of gas and diapers. He had also been averaging 7-10 dirty diapers a day!!! Every week during the last 3 weeks, a doctor would tell me it was an intestinal bug and would go away. Two weeks ago, he got sick one morning so we took him to the pediatrician. She ordered an x-ray and it showed he had “moderate stool loading in the ascending, descending, and sigmoid colons.” We figured this meant he was in route to another impaction. But all we can do is wait for him to get totally re-impacted before the hospital will re-admit him for a cleanout. It is and was a helpless feeling but we know we are doing absolutely everything anyone can think of right now. There is just no other method of prevention that we or our doctor know about. So, when the symptoms were only worse and it was 2 weeks later…….I prayed constantly to God asking Him to help me know when it was the right time to take him to the hospital. I didn’t want to subject him to the stress for no reason. When we were up virtually the entire night Monday night……I took that as my sign. We were so sure that this was it and that he would be admitted, that I packed up all we would need for a few days and set off for the hospital. To make a long story short, we were there most of the day Tuesday and came to find out he was not impacted at all. Mark and I, along with the doctors, were all shocked! He had all the symptoms and behaviors he normally does when that happens. But he wasn’t…….they could do absolutely nothing for him and that was that. His G.I. doctor was called and he wanted to see us first thing the next morning. At that appointment, he told us he feels we are doing everything possible with medication for his gut and that the problem has to be the reflux issue in his esophagus and the fact that he is swallowing too much air. Which is sending his sensory system into overstimulation mode and causing the crazy behavior. Cannon currently takes a solutab of one reflux med when he first wakes up and 2 ml’s of a liquid suspension med at bedtime. He decided to double the latter. However, that hasn’t worked either so we will now add an additional solutab before dinner. He is hopeful that things will significantly improve once we find the right balance of medication. We sure hope so, too! We also spoke with his pediatrician in regards to the results of his mulit-day EEG. It was abnormal again but with no clinical seizure activity. The abnormalities mostly reside in the parietal lobe of his brain. Which affects behavior. So I am sure this will be a hot topic of discussion when we see his Psychiatrist in a week. More medication potentially to come and balance out. Anyways…..when we went to bed Wednesday night, we had no idea what was about to happen the next day! On Thursday morning at around 5:30, my husband and I heard a series of 5 coughs over the monitor coming from the boy’s room. Mark jumped right up to go get what we thought was Cannon. I remember thinking to myself that the cough sounded funny. Deeper, less controlled, and just plain different from the average cough. I also remember thinking that Mark shouldn’t be going in there yet. They weren’t talking and didn’t sound like they were awake. But it was my birthday, and because he is so wonderful, he was going to get the kids up and let me sleep. He says when he entered the room, he was surprised to see Cannon sleeping. When he looked over at Townsend he recalls that he appeared to be shivering. When he got closer, he noticed that he had soaked his sleeper. His diaper had leaked and he thought the shivering was because he was cold. He picked him up in the dark and took him to the bathroom. When he stood him up to remove his sleeper, he noticed how limp he was. He had to hold him up to do this. He turned on the light and immediately saw we had a problem. He changed his diaper super fast and came running in to me. Mark said Townsend wasn’t talking, wasn’t looking at him, or responding in any way. I grabbed my baby and he was completely and totally limp. His neck was hanging back unsupported by his body. His breathing was extremely shallow. And his eyes were fixated to the left. He coughed a couple more times and it seemed that he really needed to vomit. So, Mark grabbed a small wastebasket and I held him over it, applying pressure to his back. Nothing. It was like he didn’t have the energy to get it out. When he would stop, I would turn him back over and try to get him to interact in any way. For 15 minutes, we did this and there was no change. With no Urgent Care nearby open for at least an hour, we knew we had to call 911. I looked at Mark and said, “Is this really happening?” I had never dialed this number before. They answered immediately and dispatched a truck. Mark ran outside to the street with Townsend still in nothing but a diaper. I called to him that we needed to grab a blanket or some clothes. He said he thought the chill in the air might shock him into responding. I agreed. The ambulance arrived within 5 minutes and they took Townsend from me. They said immediately that he was presenting as having had a seizure and we needed to get him to the hospital quickly. Poor Mark! He had to run inside and get Cannon, clothes, his special food, medicines, diapers, …….everything……..and we had to go on. He was so scared and it killed me to leave him. The driver told me I could not ride in the back with Townsend. I had to ride in the front with her. I hated this idea but had no choice. We had a long drive to the nearest hospital and we needed to get going. So, I got in the front, kissed Mark and Cannon, and we were off. The driver and 2 other paramedics were amazing! They were very kind, gentle, and knowledgeable. I called my parents and took to my Facebook family for our urgent prayer need because I had to be doing something. Halfway through the 25 minute ride, Townsend began to seize again. I was so upset to be so far away from him! I just wanted to kiss him, to hold his hand, to tell him he would be okay. But I couldn’t. I felt so helpless! The paramedics hollered up to me that he was indeed having another seizure and that they needed to give him medicine to stop it. We didn’t know how the medicine could affect him but we had to do it. So, they administered Valium and after several minutes, I saw him start to protest to all the tubes and wires. The paramedics said this was a good sign and I breathed a slight sigh of relief. When we arrived at the hospital, he was totally groggy and not himself. They brought him in and a team of nurses and a couple doctors began assessing him. They reiterated all that the paramedics had said and told me they wanted to get a CT scan, chest x-ray, and labs immediately to see if they could figure out what caused the seizures. The labs were first, then the CT, quickly followed up by the chest x-ray. Then we came back to the E.R. and waited. Most of this time, Townsend just slept. Mark arrived during the tests but Cannon struggled mightily . He does not like the E.R. So, we took turns taking him back and forth to the playroom. But, he was so anxious that we had to start thinking of alternatives fairly immediately. I called a babysitter of ours who said she could watch him at our house in a few hours. We were crazy thankful! And my parents, upon hearing the news, jumped on a plane and headed out here. A friend picked them up and brought them to our house to relieve the sitter later that night. We are so blessed! The CT came back quickly and looked good. The labs trickled in but were tough to get a hold of due to the hospital computers being down for software updates. They told us soon after we got there, that they would be admitting him to the hospital for observations and an EEG. After a couple of hours, he was transported upstairs. By this time, he was coherent and not happy with his location. He cried and whined. They had 2 IV’s set up, one in each arm, and this was not good because Townsend is a thumb sucker. With his arm boarded and therefore without his left thumb, he was not able to self soothe and he struggled. About an hour after admission, we were transported to the EEG lab and hooked up. He didn’t make it easy on the tech but after seeing Cannon go through 3 of these, I would say he did really good. They like for the child to fall asleep during the 30 minutes they are monitored for. I was disappointed that Townsend was not able to settle down and do this. Because the seizure had occurred in or just after waking up from sleep…..I wanted to see that happen. But it didn’t. It took most of the evening to hear back from all the tests and for the neurologist to stop by. It just so happened to be the neurologist who had monitored Cannon through his last hospital stay. So, that was nice. He reported to us that all the tests had come back within normal range. What a relief! I wanted to hit my knees and thank God right then and there but I settled for a quick shout out and focused back on what the doctor was saying. He told us that 10% of children will have one seizure in their lifetime and never again. Of course, with Cannon’s history, it puts Townsend at a higher risk. He said that if it is going to happen again, that it will probably happen in the next 3-6 months and we should watch him most closely when he is over -tired and sick. The doctor then presented us with our options. We could put him on a seizure medication just in case or we could get a rescue medication. We opted for the latter. You guys may remember that Cannon’s seizure medication was quite possibly making his constipation issue worse. That is why we got him off of it. And Townsend already has to take a daily laxative to keep things moving. We do not need him to start having more serious and similar problems to Cannon’s. So, we decided to get the rescue medication. 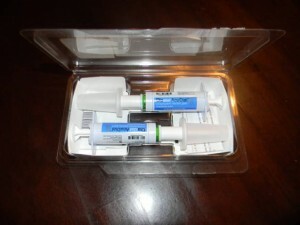 It is basically 2 syringes in a box that I will carry everywhere. If he has another seizure, I can administer it and stop the seizure. 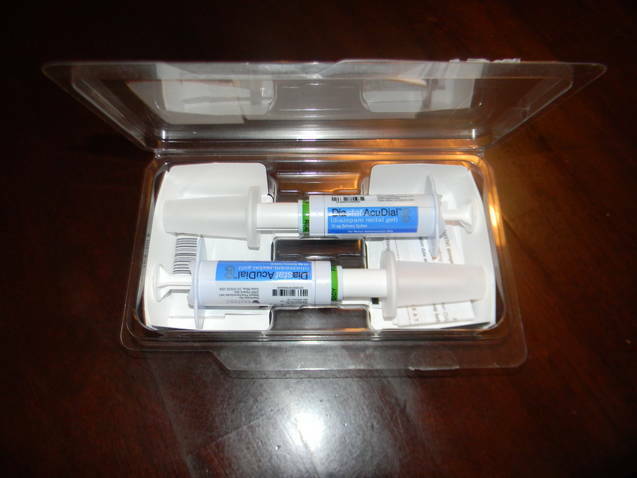 We feel good about our choice and are hopeful that I will possess both of those full syringes for a long time. And never ever have to use them. We stayed overnight in the hospital so they could keep an eye on him and make sure he went to sleep and woke up okay. He did and was totally back to his bubbly, playful, talkative self the next day. After obtaining the rescue medication from the hospital pharmacy, we came home the next afternoon. I can’t tell you how scary this experience was for us! For many reasons. First of all, it was TOWNSEND…..not Cannon! Our healthy child! The one we didn’t have to worry about! What a shock! Secondly, it is hard for me to think about what could have happened if Mark hadn’t been home. I would not have gone in there at the point he did. Unless there had been more gagging or some talking. It scares me to death to think what could have been. Even though I shouldn’t be thinking about that at all. There is one other memory that strikes me looking back on this experience. When Mark first put Townsend in my arms and I realized this was not good. My very first thought was that we had lost him ……. Just like we lost Cannon fairly suddenly. It was an awful feeling! I must say though that I am also so thankful to my Lord for the unusual calm that came over me while all this was happening with Townsend this week. I am normally an anxious mess under pressure. But this time, I was cool and mostly under control. My friends, today we are rejoicing!!!!!! Townsend is totally back to normal! And there is a chance that this will not happen to him again! We will, however, be vigilantly watching for a while. We installed a video monitor over his bed and watch him very closely when he is napping and sleeping. And I am sleeping in the boy’s room for now. The neurologist said that he realized we would have some PTSD for a while because of all we’ve been through and he thought we needed to do whatever we needed to do to stay sane. We agree! So, now we wait, pray, hope, and pray some more……that he is in that 10%! The kiddos who have one seizure in their lifetime and that is it! Only time will tell! THANK YOU FRIENDS! FROM THE BOTTOM OF OUR INCREDIBLY THANKFUL HEARTS! For all the prayes, well wishes, kind words, and encouragement! You helped get us through this awful week! We are so very very grateful! I sign off today by leaving you with a beautiful song and just a great verse. The song reminds me to “be still” and trust my Creator because He is in control, He loves me, and He is always with me, no matter what life is throwing my way. Since we brought Townsend home, I have stayed busy and relatively strong despite my exhaustion and new set of stressors. But today, I had some time alone to think and found myself having a bit of a pity party. Hearing this song helped me to remember that I don’t have to have it all together……..I just have to wait patiently and trust that God can and will give me some peace and put me back together…….in His time, in His way, for His glory. (Please have a listen!) It is called “Be Still” by Kari Jobe! And finally, I love this verse because…… it lends strength to my weary mind and heart. It is one that reminds me where my priorities and focus must remain. And it is one that gives me hope….not just for this life but for what is to come. God bless ya’ll! 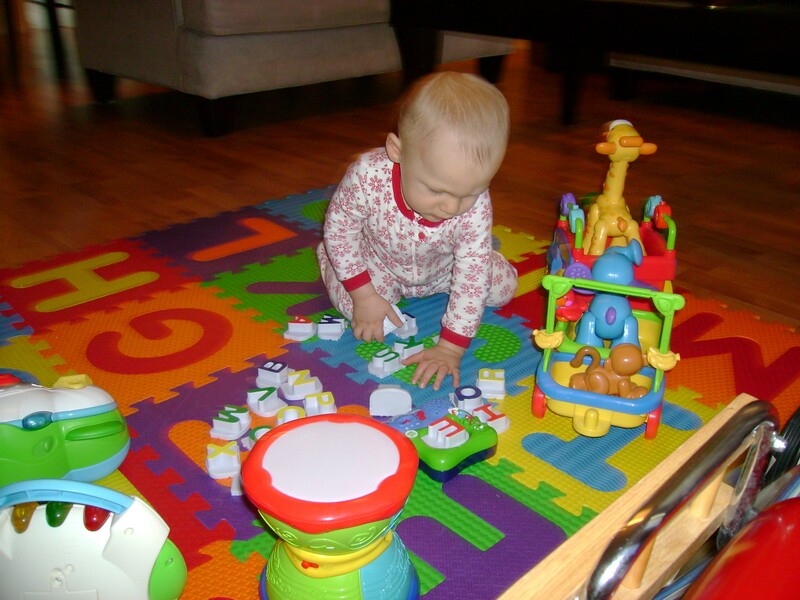 When Cannon was around 10 ½ months old, Santa brought him lots of presents at Christmas time. One of these gifts was some Leapfrog letter magnets. Cannon really latched onto these and played with them A LOT! Often when I was in the kitchen cooking a meal, he was in there with me, putting the letter magnets in the little console that identified what each letter was, what sound it made, and sang a little song. He did this over and over for months. When he was 18 months old, we were hearing him verbalize what the letters were before the console told him. Mark sat down with him and picked up each letter, all out of order, and asked him what each one was. He got every single letter right! WE COULD NOT BELIEVE IT! He was 18 months old! We had him show everyone who came over! We were so proud! I later went out and got him an additional set of the magnets. 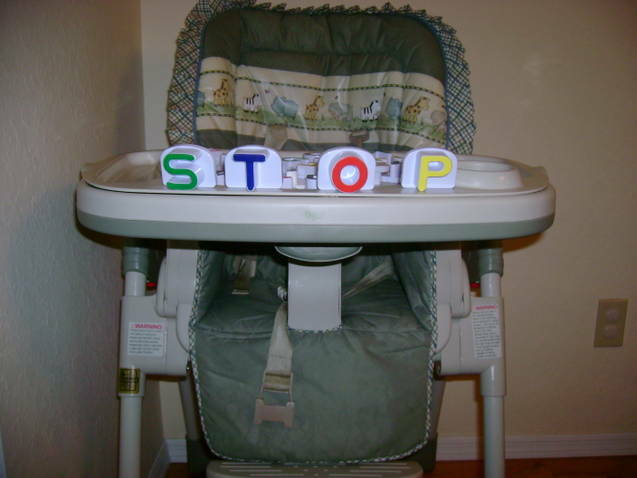 A lowercase letter set. He memorized them in a couple of weeks! Around this time, I also realized he knew all the letter sounds and could count super well. CRAZY! I made him a chart with the numbers from 1-20. So he could see what the numbers looked like. He already knew them. So, I made him another with the numbers from 21-40. 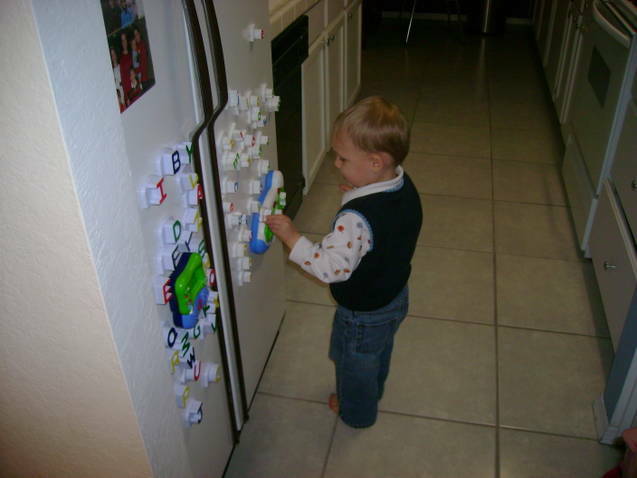 He memorized them quickly and could point to them out of order and configure them with foam numbers if asked. Then I would hear him counting and he would go all the way to 49. (I hadn’t taught him that high!) He would then look up at me and if I said 50……he would count from 51-59 before pausing again to wait for me. HE UNDERSTOOD THE PATTERN! It was incredible! Anyways, back to reading….. The lowercase magnet set I purchased came with a console that allowed you to put in three letters to make simple words. So next (at about 22 months), he began making simple words on his own. He would carry the magnets all over the house and leave words. 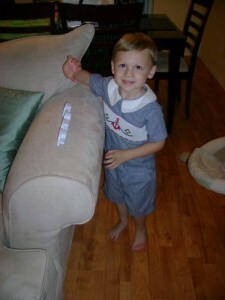 I would find them on the arm of the couch, on the entertainment center, kitchen counter, on the high chair tray, etc…. My favorite story from this time was from right after Townsend was born. I was sitting on the couch nursing Townsend and got up to do something. When I came back to the same spot to sit back down…….Cannon had left one of his words where I had been sitting. It was “F-A-T.” Nice, right?! I used to take pictures of his words in various places around the house. I even made a scrapbook page of these photos. Watching shows like “Between the Lions” and “Super Why” on PBS have only increased his ability to read and comprehend stories. “Between the Lions” is for beginning reading what Sesame Street is for letter and number recognition. And “Super Why” deals with beginning reading, reading comprehension, choosing the right word from a list of choices for a sentence, and solving problems. 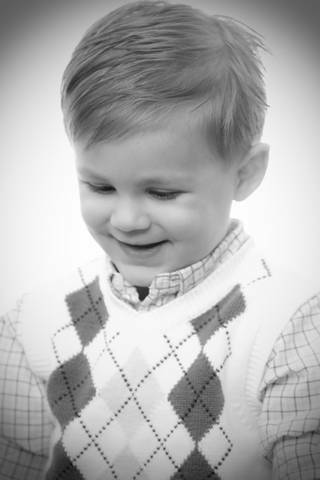 Since he began reading a few weeks shy of turning 2, he has improved greatly now that he is 4 years and 4 months old. At the end of this post you will get to see the amazing reader he has turned into! You may remember me telling you in “Our Story” and some earlier posts about Hyperlexia. This is one of Cannon’s many diagnosis’. And it describes him to the “T.” Hyperlexia is as an intense fascination with letters and numbers that far exceeds what is expected of a child at their chronological age. It can also cause difficulty in understanding verbal language and in socializing and interacting with others. Hyperlexics may also exhibit the following behavior characteristics………. It is definitely because of the Hyperlexia that Cannon is the reader he is today. Which is totally a blessing and a curse, my friends. Here is a video of Cannon reading a book that a precious friend wrote. It is very special to me both because of this friend and because of the subject matter! The book is called “I Am” and is written by Chrysti Carol Propes. Have a listen! God has blessed our sweet Cannon with an amazing ability to read! We pray he will always enjoy it like he does now! And also wonder……at this rate, will he be digging into “War and Peace” in Kindergarten?! Our hope is that his choice will be his Bible. So, that he will never feel alone and will always have hope for his future! Much love!